It is important that you read all the terms & conditions carefully and should you have any questions please do not hesitate to get in touch with us. Please read all the information carefully and should you have any questions please do not hesitate to contact us. By booking a ski course either by telephone or email you will be agreeing to these booking conditions. If you are booking on behalf of others you will also be taking on responsibility that the other members of your group have read and agree to these booking conditions. Please read them carefully and if there is anything you are unsure about please contact us immediately. All the booking conditions along with information on our website, telephone conversations and emails that you have received form the basis for your contract with Snoworks GAP. Snoworks GAP uses the services of instructors to provide the service as advertised on the Snoworks GAP website. Instructors are qualified through their governing body in their country of residence or the country in which they provide their service. Their membership through their professional organisation includes insurance to provide the services they are qualified to deliver. They are not employees of Snoworks GAP. They are self employed professionals contracted in by Snoworks GAP to provide the service as described on this website. When under their care your contract is directly with them. Should you be involved in any dispute involving an instructor where the dispute involves insurance then this will be direct with the organisation that provides their insurance, not Snoworks GAP. A £1000 non refundable deposit is required as a deposit to reserve your place on our 8 week course. Full payment is required 10 weeks prior to departure. We cannot reserve spaces on a course until a deposit has been paid. In the case of failing to pay the final balance within the specified time frame, reminders will be sent and failure to pay the final balance could result in the course being cancelled with the loss of the deposit.A smaller percentage based deposit is required on our shorter and bespoke courses, with the balance payment remaining on the same terms. If you have paid in full, you will need to claim on your own insurance, as once the full balance is paid we are unable to offer any type of refund, as we will have already paid for services by all external providers. Please be sure that your insurance policy covers these potential eventualities. The criteria for achieving the pass level at BASI levels 1 and 2 can be viewed on the official BASI website. If for any reason you do not achieve the required level, Snoworks GAP or the instructors working on behalf of Snoworks GAP cannot be held responsible. If you are unsuccessful at achieving the BASI level 1, the Gap course will be adjusted accordingly so you may re-sit the level 1 towards the end of the Gap course but not the level 2. On certain occasions it may be possible to retake the level 1 at the start or before the start of the level 2 and progress directly to the level 2. This is a matter for BASI and not Snoworks GAP to decide. 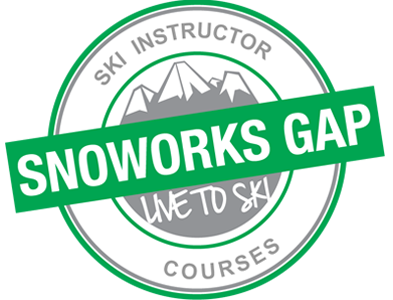 Snoworks GAP is not responsible for any extra fees incurred in re-sitting the BASI level 1 and taking the BASI level 2 outside of the Snoworks Gap course timetable advertised. The BASI level 2 is held on the final two weeks of the Level 1/2 Gap course. If you are unsuccessful at achieving the required level you can re-sit the level 2 at a later date. Course dates are advertised on the BASI website. It may still be possible to re-sit the level 2 and source work for the majority of the season. Snoworks GAP is not responsible for any extra fees incurred outside of the advertised Snoworks Gap Course dates. There are many aspects to achieving the criteria for BASI level 1 and 2. If for any reason you are not able to complete the criteria as described on the official BASI website due to injury, illness or any other circumstances, Snoworks GAP cannot be held responsible. No refunds can be given. Please make sure your insurance covers you for this eventuality. The laws in France and other countries outside the UK apply the same to residents as non-residents. Even if you are a resident in the UK you will still be expected to abide by any local laws including driving, drinking and social behaviour. Skiing is a dangerous activity and cannot be undertaken safely when under the influence or effect of alcohol, drugs or lack of sleep. Snoworks GAP reserves the right to refuse to train any candidate in this situation. Missing training could affect your ability to achieve the required level for BASI level 1 and 2. In case of persistent neglect of the above, Snoworks GAP reserves the right to ask you to leave the course with no refund available. Snoworks GAP asks every student to agree to, observe and abide, by the code of conduct of our Behaviour Policy throughout the course programme. At the time of booking you must disclose any existing illnesses or injuries that could affect your ability to ski safely and competently and not place any undue risk on instructors, guides, other group members or members of the public. Snoworks GAP will decide whether any existing illnesses or injuries that are disclosed will place instructors, mountain guides and other clients at risk after taking advice from our insurance company and the relevant skiing governing bodies. Failure to disclose any existing illnesses or injuries could result in an instructor or guide refusing to take you in a group. In this situation, refunds cannot be given. It is your responsibility to make sure you have adequate insurance cover for the ski course you have booked. By booking a Snoworks GAP course you will be taking advantage of a huge amount of experience and expertise. The instructors who work on behalf of Snoworks GAP are very skilled at developing performance as described on the Snoworks GAP website. The instructors are well trained in the safety aspects of skiing in the mountains. They can advise, help and lead you. However skiing involves an element of risk, which you must accept as inherent to the sport. You must take responsibility over your own actions and decisions when skiing on the mountain either by yourself or within a Snoworks GAP group. It is known that accidents do happen as part of skiing. By booking on a Snoworks GAP ski course you will be accepting the risk involved and accepting that an accident may happen. You will also be responsible for deciding to take part in any activity whether an exercise, a particular technique, skiing a particular slope, skiing a particular speed or skiing particular snow textures. In race training you will also be accepting whether to ski a particular ‘course’ and what speed to ski at. Snoworks GAP instructors cannot be held responsible for accidents and your actions. If at any point you wish not to take part in an activity for any reason then you must let the instructor or mountain guide know immediately. All skiers must ski in accordance with the ‘FIS Skiers’ Code Of Conduct’. Shown below. Each member of the group has the responsibility to ski in accordance with these rules. Snoworks GAP are not responsible for how each skier chooses to ski. If you are involved in an accident involving another member of the group or a member of the general public, Snoworks GAP and the instructor cannot be held responsible. If an injury occurs due to a collision or incident then your dispute will be with the person/persons involved in the incident and not Snoworks GAP or instructor. It is the responsibility of every skier whether skiing by themselves or in a Snoworks group to adhere to the FIS skiers Code of Conduct as summarised below. Failure to do so, could lead to civil and criminal liability in the event of an accident. More detailed versions can be obtained from the FIS website. COMMENT: A skier or snowboarder who overtakes another is wholly responsible for completing that manoeuvre in such a way to cause no difficulty to the skier or snowboarder being overtaken. This responsibility rests with him until the overtaking manoeuvre has been completed. This rule applies even when overtaking a stationary skier or snowboarder. COMMENT: The development of carving skis and snowboards allows their users to carve and turn upwards on the slopes. Hence they move opposite to the general downhill traffic. They must, therefore, make sure in time that they can do so without endangering themselves and others. 9. Assistance At accidents all skiers are duty-bound to assist. Hit and run offences in skiing will incur a criminal conviction similar to hit and run offences on the road. 10. Identification All skiers and witnesses, whether a responsible party or not, must exchange names and addresses following an accident. Snoworks Ltd. registered in the UK Number 250125.